Raksmey Prak is a college graduate and has been a cosplayer for over seven years now. Her first anime convention was Otakon 2010, and her first cosplay was Farah from the Prince of Persia: Two Thrones. Since then, she has loved designing, crafting, and making cosplays, and her love for attending conventions grew. She has, since then, set her alias name to AutumnVirus Cosplay. She has seen herself become more of an armor based cosplayer because she enjoys crafting, building props and armor. Not only is she a cosplayer, but she is also a freelance model and a Twitch streamer. Gaming is a big part of her life, and she is currently trying to make cosplay, modeling, and gaming/streaming a full time career. She has attended Creator Con Festival 2017 as a cosplay guest and was awarded 3rd place in the cosplay contest. She is also a confirmed spotlight cosplayer guest at Blerdcon 2017 launching this Summer of 2017 and making a cosplay guest appearance during an after-party funded by the company called The Senpai Project sometime in June. 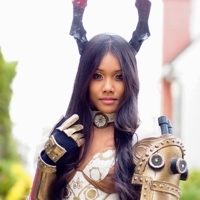 She is also a cosplay guest and cosplay judge for this year’s Norfolk Anime Explosion and Anime-Mid Atlantic! She is currently sponsored by Kawaiicrate monthly subscription, Waifuwear apparel, and Gymmonkee fitness apparel. She hopes to progress even further with her cosplays and her Twitch streaming in the near future. Cosplay and streaming aren’t her hobby, they’re her passion and dream.